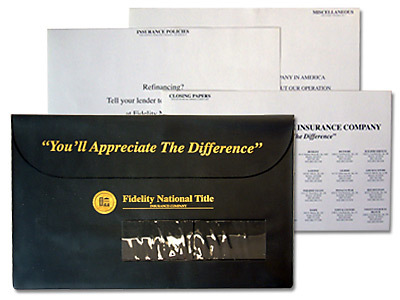 Plastic and vinyl envelopes are a great way to provide a unique and memorable document package that is sure to last and promote your message for a long time to come. If your goal is to create a heavy duty high impact mailing or packaging piece that is sturdy enough to go through the mail or even be shipped UPS then heavy duty plastic allows you to brand the piece with your logo and colors while utilizing the clear plastic to provide glimpses of the marketing material inside. Designed properly a plastic shipping or mailing envelope creates a package the recipient cant' wait to open. Perfect to packing high end marketing material designed to be delivered via mail, shipping company or even hand delivered. Vinyl envelopes or vinyl pouches are a great option for creating a lasting document package for a clients important documents and information. Vinyl envelopes and pouches can be produced in numerous colors and imprinted with your company logo, benefit statement and important information. 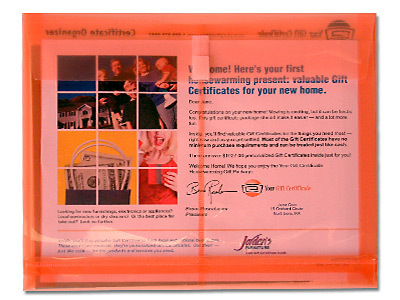 These vinyl envelopes / pouches come in various sizes and can include tab dividers or folders to organize the documents that go inside another unique feature is the ability to add business card pockets on both the inside and outside to provide complete personalization. Vinyl envelopes are perfect for real estate document, legal documents, tax documents, financial documents, or any other important documents you want your customer to keep for a long period of time.